Stripling's is a brand name of Stripling's General Store, of Moultrie, GA. The store first opened its doors in 1964, known mostly for making pork sausage. The family owned business, with the tagline, "You Never Sausage a Place", has enjoyed great success, now operating three stores in Georgia. In 1995 they began making beef jerky in their own USDA inspected facility and its quickly become a popular item, rivaling the success of their pork sausage. It was featured in the December 2006 edition of Food & Wine Magazine as one of their "Top Ten Test Kitchen Discoveries". Beef, salt, black pepper, and other spices, garlic and onion, papain, and less than 2% tricalcium phosphate (added as an anticaking agent). The first thing I taste from the surface of these pieces is a saltiness, followed by a gradually increasing garlic and onion seasoning flavor. With continued sucking, some black pepper comes into focus. Overall, a moderate surface flavor intensity. The chewing texture starts with a stronger garlic and onion flavor, and a bit more saltiness. The black pepper continues to build up an aftertaste. The flavor that seems to represent this jerky the most is that garlic and onion seasoning, perhaps more so with the onion. I'm sure there are other spices mixed into it, but it has a flavor much like that you find in a package of Funyuns (those onion ring snacks). The saltiness probably has the second most dominant flavor, which I'd rate as being high, though not too high on a single piece. But after a few ounces of this jerky, it's starting to wear me down. The black pepper is not well noticed on its own, but it does create a significant aftertaste. After several pieces, I'm feeling a good peppery burn in the back of my mouth. In terms of natural meat flavors, I'm not really tasting much. Certain pieces have some bits of fat on them, and the fat provides some flavor. 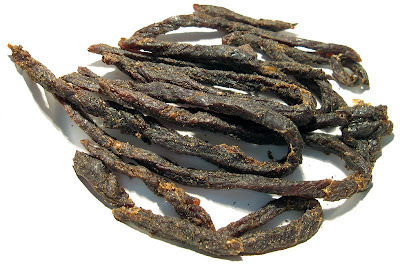 Overall, this is a very flavorful jerky, where the flavor bursts through the chewing. You're largely going to taste a garlic and onion seasoning, more stronger on the onion. There's a good deal of saltiness in this, with a significant black pepper aftertaste. No natural meat flavor. These are slices of whole meat, sliced into strips of ranging from 3 to 12 inches in length, and widths and thicknesses of about 1/4 inch. This is a dry jerky, but with a soft feel. They don't have much flexibility, breaking easily apart with some bending. Biting off a chunk is very easy to do, and chewing seems very easy. The chewing texture starts out feeling dry, but very tender. It breaks down without any resistance, and quickly chews to a soft mass. At that point, it tends to feel more mushy than anything else. Some bites I took had some steak-like chew in there, but only in the process of chewing down to a soft mass. Otherwise, most of this jerky chews mushy. Some strips have some bits of fat on them, which actually adds some nice flavor. 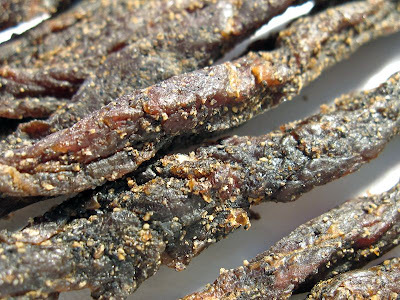 I don't see any tendon or gristle on this jerky, however I noticed several bites resulting in some small wads of unchewable tissue remaining in my mouth. In terms of clean eating, I found some small bits of seasoning picking up on my fingertips, and I also found some bits of seasoning falling on my lap. Stripling's General Store sells this Original variety of beef jerky at a price of $23.99 for a 1 pound package. With shipping costs of $12.95 (to California), the total comes to $36.94. That works out to a price of $2.31 per ounce. For general jerky snacking purposes, at the $2.31 price per ounce, this seems to provide a decent value. I'm getting some good snackability from this for its good flavor and easy to eat consistency. That $2.31 price per ounce is higher than the mass-market jerky brands found at the grocery store, but I think this does have more snackability. If you can buy this without having to pay shipping, it's a good value. 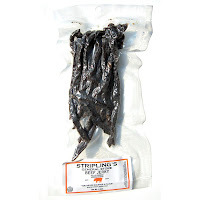 This Original beef jerky from Stripling's General Store has a lot of flavor, mostly as garlic and onion seasoning, and a little stronger on the onion. There's also a noticeable black pepper flavor, largely in the aftertaste. It's also quite salty, which I'm not a big fan of. On top of that, I'm not getting any natural meat flavor, aside from what flavor I can get through the small bits of fat. But it's very easy to eat. Biting chunks off of these strips seems effortless, and I could chew through a pound of this jerky without my jaws getting tired. But I didn't care much for the chewing texture, being mostly mushy as opposed to feeling like a piece of steak. Otherwise, if you like that garlic and onion flavor in beef jerky, this has a lot in it. My recommended beer pairing for this, go with something lighter on flavor, like cream ale, or pale ale.